I've been running a ton lately in order to train for the approaching tennis season (tryouts are next Monday, ahh!) 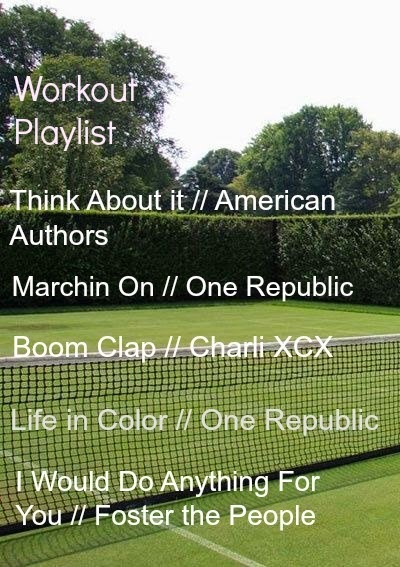 and nothing motivates me like a great workout playlist. To keep a good variety, I listen to a few One Republic tunes (my favorite artist at the moment!) along with some American Authors, Foster the People and various others. I like to keep the songs upbeat so I forget I'm running and enjoy the music. The best part? When you crank up the songs extra loud, you can't hear yourself dying ;) My goal was to run everyday last week and I successfully went 2.5 miles each day, a few record for me! I'm really going to continue the pattern because it's getting easier and easier which is strangely amazing. I'll keep you updated on how it goes! What are some workout songs you're into? I need some more to add to my list! Yippee! I've been needing a new playlist! I'm so excited to add these songs in! Thanks, Carin! I've been needing a new playlist! I love all these. Thanks Caroline! Thanks! I've been wanting to change up my workout playlist.